We are UK and European stockists for SpinOlution spinning wheels. Buy a spinning wheel here. Having your own spinning wheel allows you to make beautiful yarn exactly the way you want it. You are in control; you can choose which fibres to use and blend the colours till they are just right. Handspun yarn is more attractive than commercial yarn, resulting in eye-catching jumpers and hand-woven cushions. Not only will you end up with a better product, you will get more enjoyment out of your knitting or weaving if you use handspun wool. Modern spinning wheels are much easier to use than traditional ones, and the new portable travel wheels allow you to transform spinning into a fantastic social occasion with a group of friends. 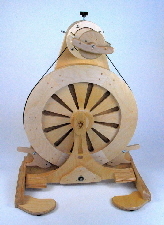 Learn more about spinning and spinning wheels here and the history of spinning wheels here. Fibres are natural or synthetic filaments that can be spun into yarn. Wool, flax and cotton are examples of natural fibres and nylon and polyester of synthetic fibres. The Wild Fibres website is about natural fibres from animals and plants and their use for weaving, spinning and dyeing. It covers wool and hair from sheep and other fibre animals, such as alpaca, cashmere, mohair and angora rabbits, silk from insects (silkworms), and plant fibres such as cotton, flax and linen, nettle fibre and hemp fibre, amongst others. If you are spinning or dyeing with natural dyes, you will want to use your dyes on natural fibers and textiles. You are in the right place to learn about them. For re-enactors looking to re-create authentic period costume for Anglo-Saxon, Viking, medieval or Elizabethan re-enactment, you will need to use natural fibres that are authentic to the period and to dye them with the right natural dyes. We aim to cover both the traditional and modern uses of natural fibres for textiles and clothing, and through our related site - Wild Colours - the use of natural dyes and the practice of dyeing. The left-side menu takes you to 3 main summary pages covering animal fibres (including wool), silk and silkworms, and plant fibres. Clicking on each of these menu buttons opens up further menu options to subsidiary pages. If there is something else you would like to see or you did not find the detail you expected to see, please let us know via the Contact page. Feedback is welcome! Thank you for browsing our website and enjoy your visit! Graphical timeline for history of textiles!